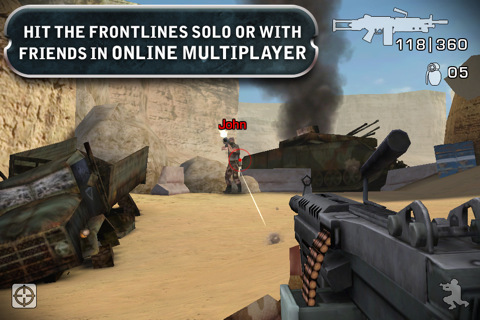 Battlefield: Bad Company 2 Now Available For iPhone! Finally it’s here folks. One of EA’s best selling FPS games in the market: Battlefield: Bad Company 2. Battlefield Bad Company 2 is an absolute steal at that price, and a sure-fire must-have for anyone wanting to dip their toes into the first person shooter market without spending too much. This iPhone version is based heavily on the PS3 and Xbox 360 game of the same name, although the levels (of which there are fourteen) are dramatically reduced in scale to fit in with the notion that portable gaming needs to be done in quick bursts. There’s around five hours of gameplay here though, so don’t think you’re getting something that’s not going to keep you busy for a few nights. Indeed, most levels vary dramatically in terms of location and the style of play needed to get through them, and there’s a tank and a helicopter section too. The actual on-foot shooting is probably one of the best examples of the genre on the platform. A smooth training sequence eases you in but essentially the left half of the screen is used to move and the right half to ‘look’, the perfect translation of the traditional twin-stick console controls. Firing is done by tapping the screen, and from there you can hold the thumb down to keep the trigger pulled, as well as simultaneously aiming by gently moving. Other on-screen buttons like zooming, changing weapons, throwing grenades and crouching work fine, but EA have added in lots of different control methods anyway, so there’s likely to be something you’ll be comfortable with. The story won’t really blow you away (you’re sent behind Russian lines to investigate increasing threat levels) but the levels ebb and flow nicely without ever being overly ambitious. The pacing’s fine, there’s some decent set pieces and you’ll be required to don your stealth jacket more than once. The game doesn’t encourage sneaking around normally, mind, but it’s a valid option for a good portion of the game and the knife attacks are a useful tool (and a somewhat visceral) pleasure that shouldn’t be underestimated. The graphics are great too – there’s Retina support for iPhone 4 but thankfully not at the expense of a decent frame rate, which remains reasonably smooth throughout. Textures hold their own up close, and whilst animation is clearly sub-console it’s more than good enough for the small screen and the enemy AI, which sees soldiers using cover just as much as the player (which is performed automatically), is impressive enough. Bad Company 2 won’t win any awards for its looks, but the sound, with nice voice overs and convincing weapon noises, helps to build the atmosphere. Aside from the single player campaign mode there is also a four player multiplayer mode, which works both locally and online over the internet (and supports 3G, too, you don’t need wifi). There’s two modes – Free for All and Squad Deathmatch, and only 2 maps – hopefully EA will add further support to this portion of the game down the line if it sees enough players taking part. There’s push notifications, too, so if someone invites you you’ll get the traditional message up on your iPhone in real time. Game Center would have been preferable, but it’s a decent substitute. As said earlier, shooter fans will love what EA have done with Battlefield Bad Company 2 – it’s a solid example of the genre and at that price it’s pretty much a no-brainer. There’s flashier graphics around (Rage HD, for example) and perhaps better single player shooters (Gameloft’s Modern Combat series feels a bit punchier) but as an all-round package the game’s a pleasant surprise and is consistently good fun. If you liked the console games or just fancied having a look at what the iPhone (and, of course, the iPod Touch) can do with just a touch screen then this is well worth picking up. Click here to buy the app from the App Store.